While the bow seems well-made, not the same thing can be said for the accessories. Right-handed archers who are new to this fascinating hobby will discover a great ally in the Leader Accessories Compound Bow. As there’s no need for assembly once the model is delivered to your door, you will be able to head out to hunting adventures right away. Several accessories are provided to make your introduction to the world of archery a breeze. There is no need to spend on expensive gear when only a novice shooter uses this model. While many may argue that the overall quality of the accessories leaves plenty to be desired, the fact that they are there can make beginners more confident in their abilities as they try taking aim and shooting arrows for the first time in their lives. From the first moment you touch this bow, you will notice how well it is made. For beginners, and not only, this is a crucial aspect, as a poorly designed bow can make it harder to land shots, especially without hours of practice under your belt. The machined aluminum riser already has the necessary cutouts for attaching accessories, so, in case you are interested in upgrading your bow with extras, you will be able to do so without a glitch. Also, the aluminum components bring the total weight of the bow to 3.3 lbs, which is something that most people can carry and use. The ABS limbs are sturdy and dependable, as well. The pivoting pockets that hold them look like they could support some wear and tear, which counts toward the overall lifespan of this model. It must be mentioned that the cams from the dual cam system are also made of aluminum, to keep the entire weight of the bow as low as possible. You must bear in mind that mounting accessories on your bow will make it heavier and less comfortable to use than without them, but, overall, the manufacturer’s care for keeping the total weight of the bow to a minimum is laudable. The first thing that must be mentioned here is probably the fact that this model is only available in the version for right-handed shooters. Keep this in mind, to avoid having to send your order back. 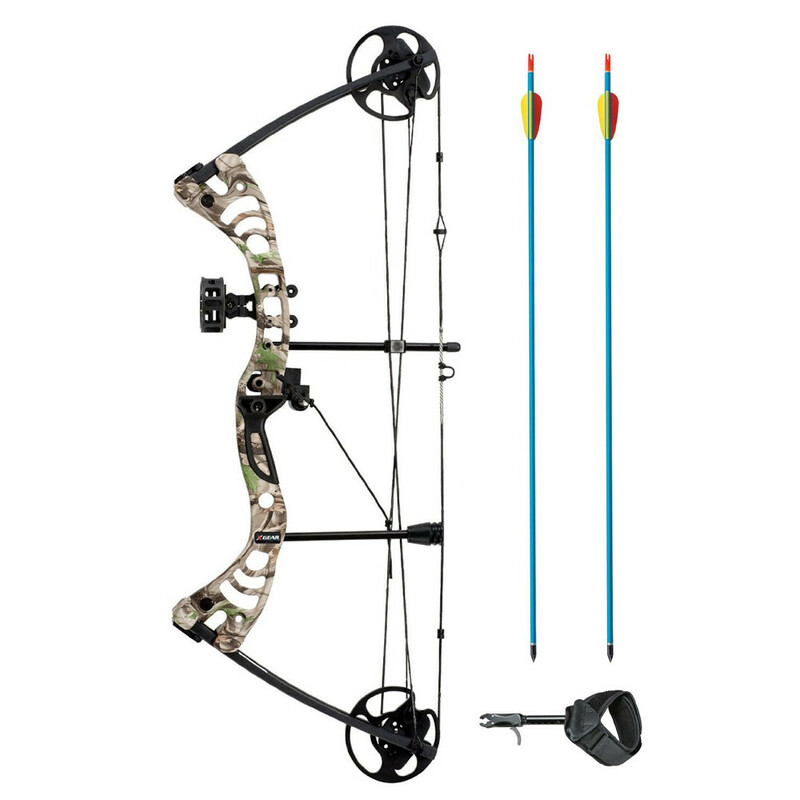 The 28” axle-to-axle length makes this compound bow a compact choice. Female shooters, as well as teenagers, will find it much more accommodating than others for this reason. Both weight and length can be adjusted, and there’s no need to use a bow press when customizing the bow for the user’s needs. A nice variety of camo and color variations is available, and you can pick the one you prefer. The dual cam system helps to deliver a smooth action that even more advanced shooters will appreciate. This bow with accessories is a good option if you look for an ideal opportunity for beginners. The draw weight varies between 30 and 50 lbs, while the length varies between 19” and 29”. With a let-off design of 70%, the bow compensates well the required weight for drawing the bow, and that is why even young shooters can use it. With a maximum speed of 296 feet per second, it is a compound bow with decent velocity, which means that you can take it along when hunting. Another feature that we must talk about is the array of accessories that come with this model. You will get a fiber optic sight that will help you acquire your target with more efficiency than with the naked eye. A drop away rest for your arrow also comes with your purchase, and there’s also a release aid included to make your job of releasing your bolts easier than before. You will also receive a peep sight, a loop, wax for maintaining the string, and two arrows made of aluminum. The bow we review here is quite noisy if you use it without a stabilizer. If you intend to use it for hunting, it is essential that you don’t forget this simple piece of advice. Releasing your arrow, and generally using your bow, will draw the attention of your prey, especially if you are after game with sensitive hearing, like deer. Should you decide to bring down the noise and reduce vibrations, investing in some limb silencers is a good idea. Such accessories, however, are not included in your purchase, and you will have to purchase them separately. For bow hunting, and even bow fishing, this model offers the required performance. It is, however, ideal mostly for beginners, and shooters who want to obtain more than just the usability of a novice hunting weapon, may not be that pleased with it. However, if you are starting out, and you want something suitable for your skill level, it is quite a desirable option. As it comes along with a few accessories, you will discover that it is easy to use, and adjusting it won’t be a problem either. 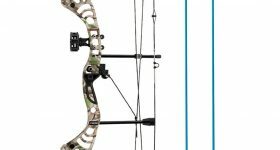 The compact design will allow you to move through dense foliage without worrying that your bow might get caught up in some branches.